Antinous is a Moon God. He is, of course, many other things and he wears many hats. But one of the ways he was worshiped in Antiquity was as ANTINOUS THE MOON GOD. His worshipers looked skyward and saw His beautiful face perpetually turned towards the Earth. The Man in the Moon was actually the Blessed Boy in the Moon for the ancient priests and worshipers of Antinous. Swiftest and most youthful of all the Zodiacal deities, Antinous speeds through an entire year's worth of Astrological signs in just 28 days. ANTINOUS THE MOON GOD represents our deepest personal needs, our basic habits and reactions, and our unconscious gay selves. Where Hadrian the Sun acts, Antinous the Moon REACTS. How do we instinctively react or respond to problems? What do we feel we need for a sense of security? Look to ANTINOUS THE MOON GOD for answers. ANTINOUS THE MOON GOD is both our inner boy child and our inner lover. His ever changing phases, as he sweeps past all the other Planets in all the Signs, make us at turns responsive, receptive, and reflective. 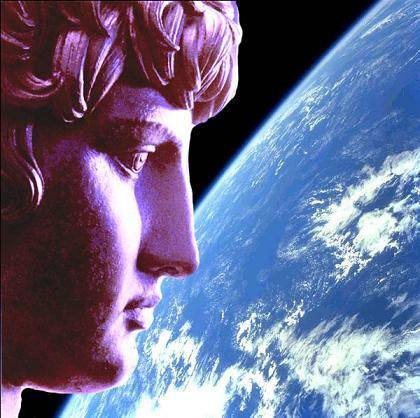 Eternally youthful, ANTINOUS THE MOON GOD represents our childlike spontaneous and instinctual reactions. ANTINOUS THE MOON GOD beams down on us to make us imaginative, creative, intuitive, sentimental, adaptable, introspective, and protective. On the negative side, and depending on where he is in the Zodiac, he can make us moody, restless, and irrational.